Before putting away the sunscreen and swim suits from spring break, Drum Corps International reminds fans that this Friday, April 4 is the last chance to submit your spring break photos for a chance to win one of several great prizes. This spring, Drum Corps International asked fans to keep their "DC-eyes" wide open for the perfect spring break destination photo with travelers wearing their favorite Drum Corps International or corps apparel. With spring in bloom, be sure to e-mail your photos to DCeye@dci.org before this Friday, and make sure your summer destinations include the Drum Corps International Summer Tour. Take a photo of yourself on your travels wearing Drum Corps International or other corps apparel – your favorite corps T-shirt, sweatshirt, hat, jacket, etc. Whether it's a Troopers T-shirt in front of the Taj Mahal, Mandarins corps jackets next to Mickey Mouse, or your best Cavaliers wear in the Caribbean, share your drum corps spirit across the globe and be sure to capture it with your camera. 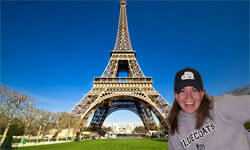 E-mail your photo to dceye@dci.org, subject line: Spring Break Photo Contest. Include your name, e-mail, mailing address and a description of where the photo was taken. Photos will be judged for their creativity and composition by a panel of DCI.org staff members. Only one photo entry per contestant will be judged. Prizes will only be awarded to the person submitting the entry. All entries should be received by Friday, April 4, 2008. A complete 2007 World Championships DVD collection and a 2008 World Championships T-shirt. A 2007 World Championship Div. I Finalists DVD set and a 2008 World Championships T-shirt. A 2007 World Championship CD set and a 2008 World Championships T-shirt.